(Friedrich) Ludwig Hofelich was born in Leipzig on October 30, 1842, as the son of the tailor Johann Conrad Hofelich and his wife Christiane Friederike (widowed Tetzel, nee Grahmann). 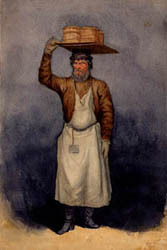 In 1860, Ludwig went to St. Petersburg to work as a xylographer (i.e., one who makes prints from wood carvings) to earn the necessary funds for his studies as a painter. He learned the xylographic art from J. G. Flegel in Leipzig. Ludwig's half-brother, Karl Tetzel, was also a trained xylographer. In St. Petersburg, Ludwig's art was very well received and sold well. After only three months Ludwig was able to repay his father the 60 Taler which he had lent to his son. 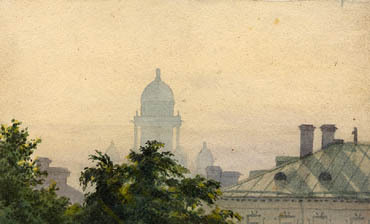 Beside his work, Ludwig attended the St. Petersburg Academy. He lived extremely modestly and spent his limited funds on material needs. From his savings he purchased mainly books so as to train himself further. He rented a piano and studied both music and language until late into the night. His tremendous learning eagerness pushed him to the limit and he got sick with a violent nerve fever. In order to recuperate and to come internally at peace, he prepared a sailing boat and spent many hours on the River Newa. At the Erimitage he studied the work of famous artists, and gradually recovered, although his health was susceptible from then on through the rest of his life. 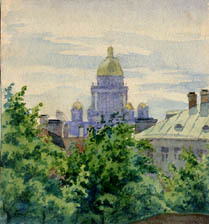 In 1865, Ludwig returned to Leipzig and studied at the academy, as well as in Berlin and Dresden. He continued to work as a xylographer to earn his living costs. In 1868, a stay in Salzburg followed. Due to his health - the physicians recommended much fresh air to him - Ludwig, who painted initially figurative paintings, dedicated himself increasingly to landscape painting. On study stays in Switzerland, Italy and Bavaria he particularly self trained himself further. In Munich he finally established himself. There he sold his first picture, a copy of Vautier, for which he obtained a very good price. His paintings met with approval of the public, and art dealers became attentive to him. Within a short time Ludwig - as per the Family Chronicle - could have earned a fortune, if he had taken advantage of the favorable times at the beginning of the 1870s. But his works were not sufficient for his artistic requirement yet. He wanted to make it better, not suspecting that the end of the good times for painting sales was approaching briefly. In 1873, the art dealers cancelled their orders and Ludwig had to take his burin again, in order to secure his bread winnings. Despite the strained economic situation he found the courage to marry and start a family. In 1877, in Stuttgart he married Laura Seelinger, a professor's daughter born on June 22, 1848 in St. Gallen, Switzerland. The young married couple moved into a small flat nearby the Sendling Gate in Munich in September 1877. During six months of the year - from April to October - the couple always spent time in Bernried at Starnberg Lake, in house number 18 ½ (today Reitweg No. 8. ), with the landlord Breitenberger. In his free-time Ludwig dedicated himself now completely to landscape painting, although he continued to work in the main as a xylographer. Laura gladly would have contributed to the living costs. She studied music and before she married was very successful as a piano player. However, it was not possible for her to develop a circle of students in Munich, because Ludwig insisted that she accompany him to Bernried from spring to autumn. A complete description of the life of the couple brings the birth of the first son Wilhelm, who was born on August 5, 1882 during the paternal summer holiday stay in Bernried. Arnold, the second son, was born in Bernried on June 23, 1885. While children were young, the whole family spent half the year in Bernried. In later years, when the boys had to go to school, Laura remained in Munich with them, and Ludwig stayed many weeks alone - withdrawn and away from people - in the countryside to paint in free nature. In 1900, Ludwig finally abandoned xylography, primarily because the practice was no longer competitive on account of the then modern chemical techniques. 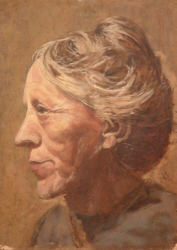 From then on he dedicated himself with much eagerness to his beloved landscape painting. His energy was admirable, in which he trained himself toward end of his life in modern view and technology. The number of works, which developed in the last three years, is amazing. 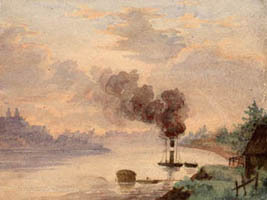 From the 97 paintings, which were issued after Ludwig's death at Munich Glass Palace, about 40 came from this last period. In October 1902 his last study route lead Ludwig again to Seeshaupt and Bernried at Starnberg Lake. Exhausted, he returned to Munich and worked untiringly until three days before his death in the morning of January 12th 1903. He succumbed to a relatively easy illness, because his weakened body was not resistant enough. On the basis of the heroic and romantic landscape around 1870, which is reminiscent to Böcklin, the art of Ludwig Hofelich had turned ever more to the intimate nature description completely simple motives - in particular from the environment of Munich. 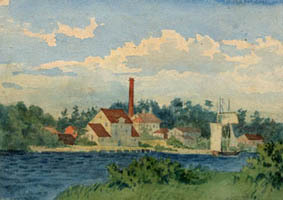 His landscapes are related and equivalent to "the Lier School" (Thieme/Becker). Regarding the intimacy of the nature feeling and sovereigns the control of the expression, he is in accord with the older Schleich and his circle of friends. And he had come nevertheless to the landscape painting in certain sense as a self-study. In Leipzig he had begun at the Academy as a figure painter of large style, with strong inclination to religious and historical themes. Only his illness, which required much fresh air, put him on course to landscape painting. When Ludwig adjusted himself to the intimate landscape painting, he approached his strongest achievement. He made the closer and further environment of Munich his preferential study district. The Starnberg Lake and its landscape arranged the impression of high, clear air and the soft, colored atmosphere for him. The loveliness of the area of the River Amper around Wessling, Fürstenfeldbruck and Emmering, where he was gladly and often, came to meet the tender course of his nature feeling. The romance of his beginnings was overcome and made place for the realization that it didn't require the outside/outer greatness or peculiarity of the motives in order to express the internal size of nature in the picture/painting. Ludwig loved the park of Bernried with its old tree existence, the water sources and small ponds. Also, the Lake Tegern, at three sides surrounded by mountains, as well as the valley of the River Isar, had a strong attraction to him. The [resistents] of Munich's north landscape, including Freising and particularly Ismaning, corresponded to the mind set of his later years. 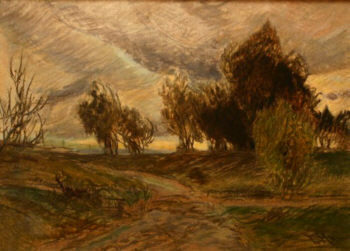 It is a bitter mixture of melancholy longing and defiance in Ludwig Hofelich's last landscapes, which often translate storm and autumn and grey hours into the stylistic idiom of the painting. Heavy sky can be seen in these paintings, with clouds hanging down on the withered countryside - a tendency of parting, much as in life.